In need of precision wire EDM services? You’ve come to the right place. We’ve been offering precision manufacturing to companies all across the country since 1969. Unity has wire EDMs capable of multi-axis work ranging from .004 to .012 diameter wire, as well as automated pallet loading, which allows continuous 24/7 automation. • 3 Fanuc Robocut x-c400iB: Wire EDM’s in a Fanuc Robot loading cell, Max Work piece X 15.75, Y 11.81, Z 10.04, and .004 to .012 wire. One machine has programmable rotary with turn and burn capability. 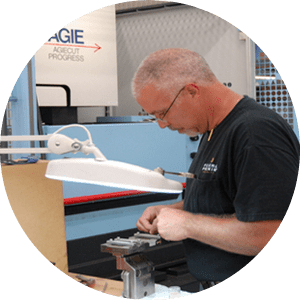 Providing wire EDM machining and other services is a passion. As a family company, we take pride in our name. After all, it took three generations to build to the esteem it has today. When you call our team, you’ll get the friendly, Midwestern customer service you would expect along with a great deal of expertise. Get started by giving us a call at 763-428-9888 or requesting a quote.